Husky PVC Air Hose is ideal for general purpose applications. It features a lightweight, durable design. Best for contractors and home users. Its bright florescent colour reduces changes of tripping while on a job site. This rubber lead-in air hose absorbs the vibrations and pulsations from air compressors and air impact tools, providing longer life for the balance of the pneumatic system. Ball swivels allow for greater flexibility and bend restrictors prevent the hose from weakening and breaking after frequent sharp bends. This hose is constructed of hybrid materials, giving you the strength and flexibility of rubber with the light weight of PVC. Pliable in even sub-zero temperatures, the hose lies flat or coils up nicely at the end of the day. All weather flexibility lets you work anywhere from -400F to 1640F. Bend resistors prevent wear and tear at the joints, and a kink resistant design prolongs the life of the hose. The < inch NPT fittings and universal coupler are made of solid brass for better performance and increased durability. Reaching 50 ft. long, this hose delivers 300PSI for maximum working pressure. The rubber coating protects it from wear and tear, and is tough enough that you don't have to worry about damage from snagging, dragging it over abrasive surfaces, or rolling over it. It is oil, electrical, and chemical resistant, making it perfect for any workspace. 1/4-inch PU hose 50 ft. with repairable connections. The light weight of polyurethane hose makes it ideal for applications where dragging a heavy hose is an issue, like roofing. The smooth, non-marring finish also makes it ideal for indoor trim work where scratching surfaces could create damage. Maintains very good cold weather flexibility. The Husky 4-Piece 1/4 inch Industrial-Style Quick-Connector Kit makes it easy to connect air tools to an air hose without discharging the air system. Air tight locking system for maximum pressure. Super durable for a longer life. Heat-treated steel provides a long service life. 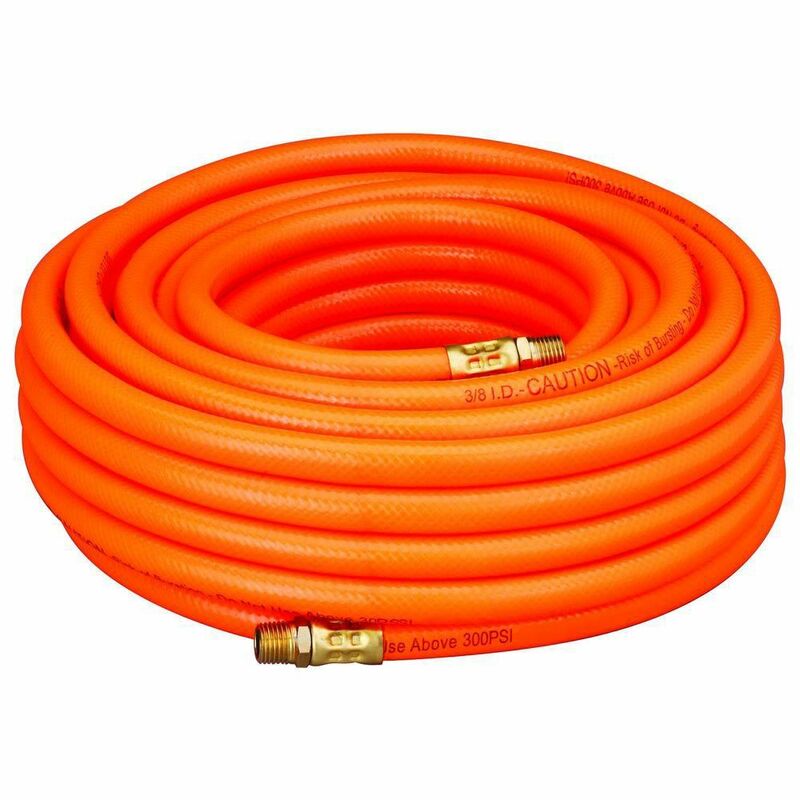 3/8 Inch x 50 Foot PVC Air Hose Husky PVC Air Hose is ideal for general purpose applications. It features a lightweight, durable design. Best for contractors and home users. Its bright florescent colour reduces changes of tripping while on a job site.